~~~~ VISIT OUR SHOP! Other characters available! ~~~~CUSTOM STAR WARS BB8 BIRTHDAY SHIRTS ~~~ Let's Get the Party Started! It's your Birthday! 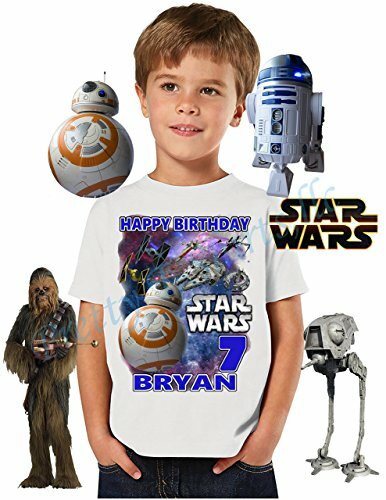 ~~~ This Star Wars Birthday Family Shirt says: " HAPPY BIRTHDAY " plus age number (as showing) are perfect for your little boy party. These shirts will give the nice touch to your birthday party. Make one to remember forever with our Custom Star Wars BB8 Birthday Shirts. This child birthday shirts are customized with ANY name and ANY age. ~~~~~~ HAPPY BIRTHDAY PARTY!! If you have any questions about this product by PrettyT-Shirts, contact us by completing and submitting the form below. If you are looking for a specif part number, please include it with your message.